Many people make backups of their games to be able to enjoy them while they keep the original CD-ROM / DVD safe. In some of those cases the copies are done on another optical disc, but there are also people that prefer to create disc images on their computer's hard drive, because the reading speed is much higher. The problem with these backups can come when the game uses the SecuROM protection system, because if it detects the presence of a virtual reading drive the game will automatically stop working. To avoid this you can resort to Virtual CD Hide. 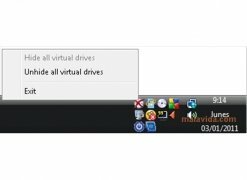 This small executable will open in the taskbar and is shown as a CD icon with a tick mark, if you right click on the icon a context menu will open with three options: hide the virtual drives, show the virtual drives and exit. If you select the first option the icon will change to that of CD with a cross, and the virtual drives will no longer be visible for the SecuROM protection system. Therefore, if you want an application that will allow you to use your disc images with the SecuROM protection from a virtual drive, download Virtual CD Hide. Requires Daemon Tools or Alcohol 120%. This download also requires a RAR compatible compressor. The developers have tested it with SecuROM v5 and v7.